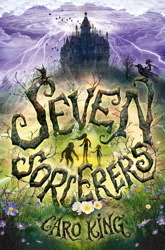 Seven sorcerers is an entertaining novel for experienced readers, It is about a girl named Nin who’s woken up on a normal Wednesday morning to find out her brother was stolen and she’s the only one who remembers him. Can she fight powerful enemies who have no sense of mercy and get her brother back? Or will she die… As Nin thinks nothing can get worse no one can remember her! This is a wonderful fantasy that reminds me of Harry potter but keep in mind this is a scary book.